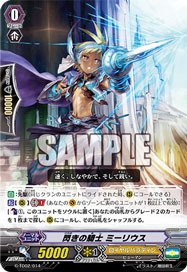 [A]: [Choose an ::Angel Feather:: in your hand and put it in the Damage Zone] When this is placed to (G), if you have an ::Angel Feather:: Vanguard, you may pay cost. If so, choose a card in your Damage Zone and put it in your hand. Those idiots who get in the way of people's love shall be kicked by a horse!